Think of this meal as a deconstructed steak burrito. 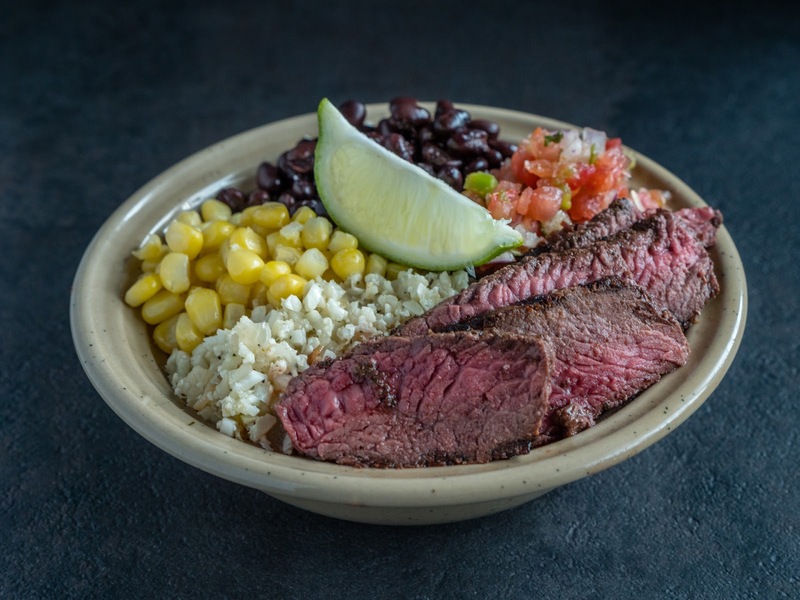 It’s got the steak, beans, corn and fresh salsa you’d expect, but it’s all placed on top of riced cauliflower instead of being wrapped in a flour tortilla with lots of rice. It’s healthy, lower carb, and full of flavor. Plus, it comes together in under 30 minutes. As much as I like to make everything from scratch as often as possible, some days it's just not going to happen. This recipe is all about using shortcuts. There's no shame in taking the assistance when you need it. It's still a homecooked meal, but with less prep work. 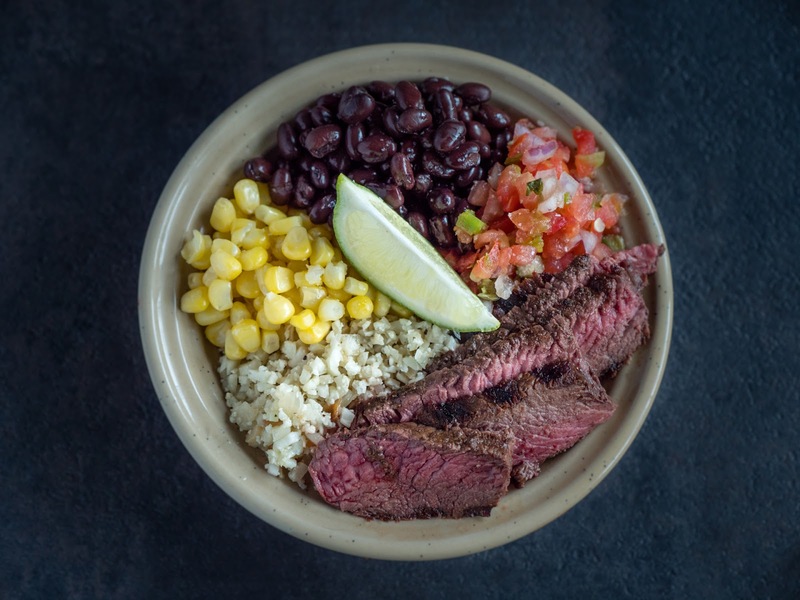 To save time for this meal, I used canned black beans, frozen corn kernels, supermarket-made pico de gallo, and supermarket-prepped riced cauliflower. All I needed to do was cook the steak, thaw the corn kernels, and heat the cauliflower rice with a little onion and garlic. The key ingredient was the Spice Hunter Coriander Lime seasoning I used both on the steak and the riced cauliflower. (This is totally an unpaid promotion here, I just love this stuff.) I love the little bit tart, little bit sweet flavor it adds to grilled meat. For me, spice mixes are the secret ingredient when relying on already prepared ingredients. 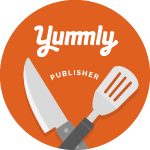 They are the unique twist that pulls together all those ready-made items and makes the meal my own. I definitely recommend making your own spice mixes ahead of time so they will be ready to go whenever you need them; but again, if you don't, there are plenty of quality blends in the spice aisle. The moral of the story is that you can make a healthy dinner on a weeknight without a lot of extra work. Go ahead, use the prepared ingredients when you need to ... I won't tell anyone. Place the steak on the grill and cook for 4 to 5 minutes. Turn over and continue to grill 3 to 5 minutes for medium-rare (an internal temperature of 135 degrees F), 5 to 7 minutes for medium (140 degrees F) or 8 to 10 minutes for medium-well (150 degrees F). Assemble the bowls. 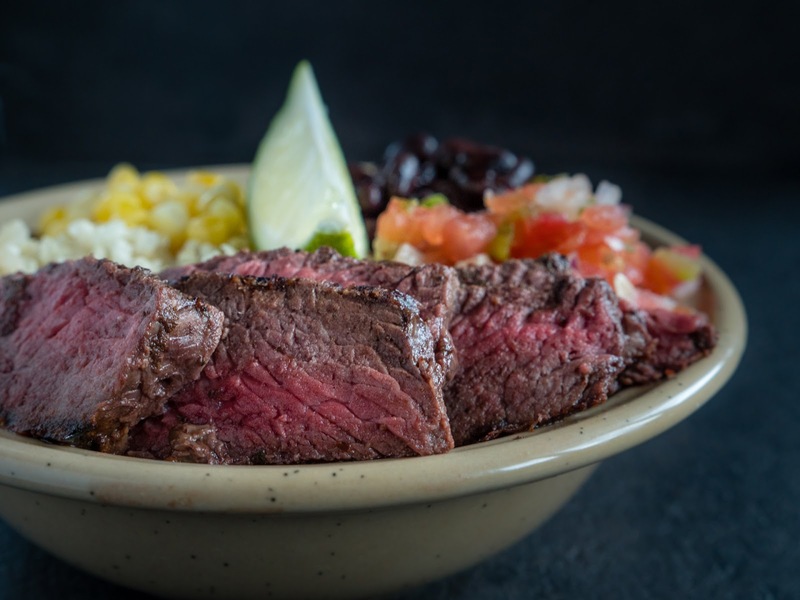 In each bowl add 1 cup of the riced cauliflower mix, 1/4 cup black beans, 1/2 cup corn kernels, 2 tablespoons pico de gallo, half the steak slices, and a lime wedge. You had me at grain free! Looks so yummy! I have been loving riced cauliflower lately. Such a great substitute. Seems like a pretty solid meal to me! I didn't know there are supermarket-prepped riced cauliflower. Must look for that next time.